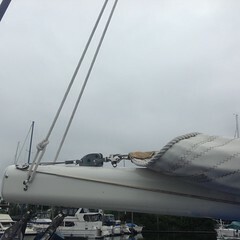 John at Hanamoenoa Bay – photo taken by Susan on SV Athanor. Warm, clear water where sharks like to hang out on the reef. 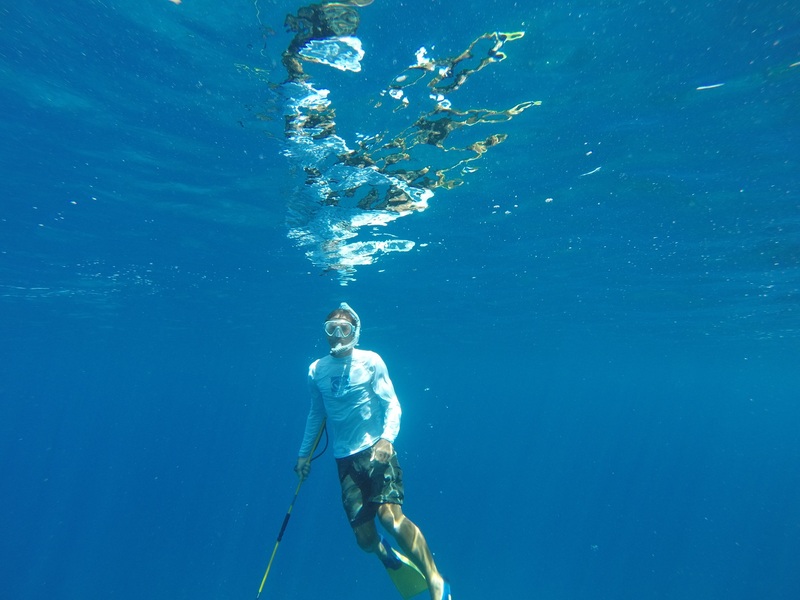 John wasn’t able to spear a fish for the BBQ but he had a wonderful time diving and watching Steven, the local Marquesan resident spear enough fish for 12 people. 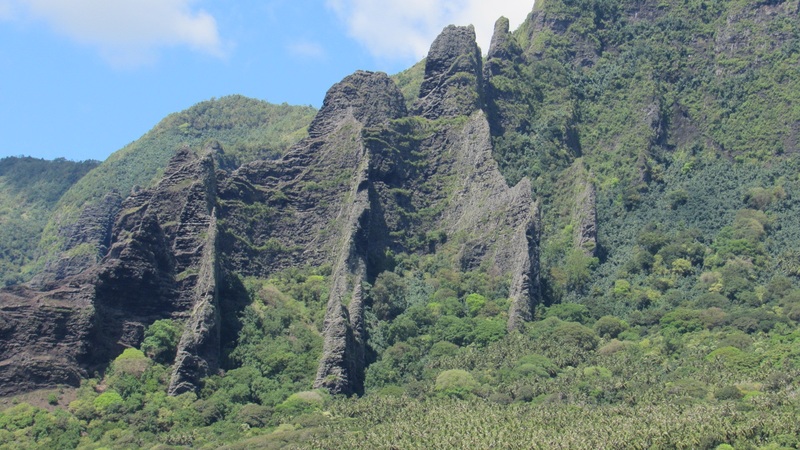 We departed for Nuku Hiva the next day. We left Tahuata Island for Nuku Hiva . 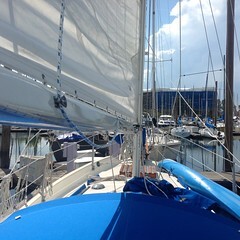 An overnight passage of 85nm. 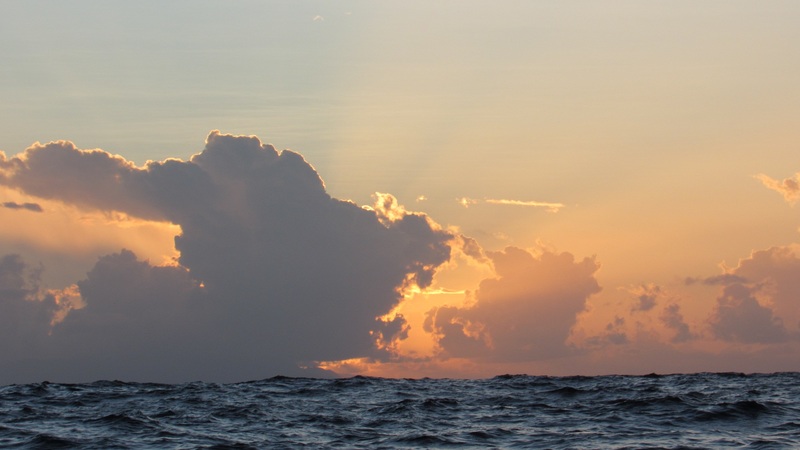 We sailed most of the way in lumpy seas, approaching Nuku Hiva in a large squall. We’ve been here for nearly 2 weeks and still haven’t seen everything. 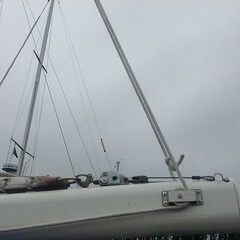 We sailed up the East side to Anaho Bay, a superb anchorage with protection from ocean swell and cooling east breeze during the day. 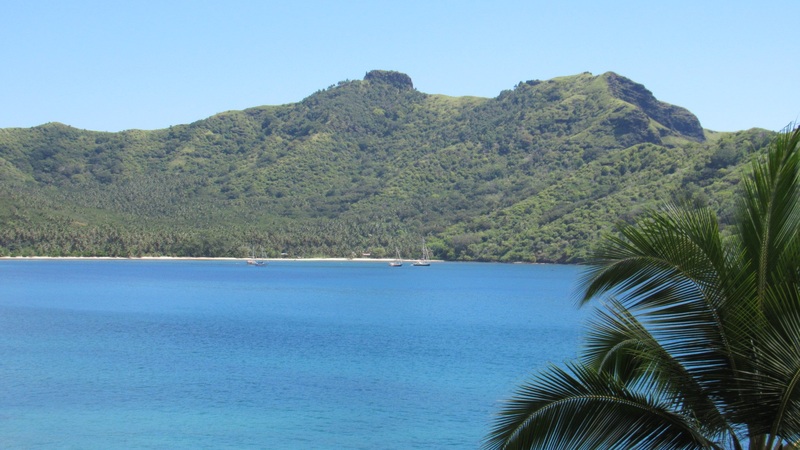 Hiked over the hill to Hatuatua Bay – beautifu,l white fine sand beach lined with coconut trees, towering peaks and basaltic ridges jutting from the mountainsides. From Anaho we motored 1.5 miles into Hatiheu Bay. This was Louis Stevenson, a Scottish writer’s favorite bay. The archaeological sites were stunning and so worth the 2.5 hour hike in flip flops and no bug repellent. The timing was an accidental meeting of a kind, local farmer who spoke fairly decent English and knew his history. 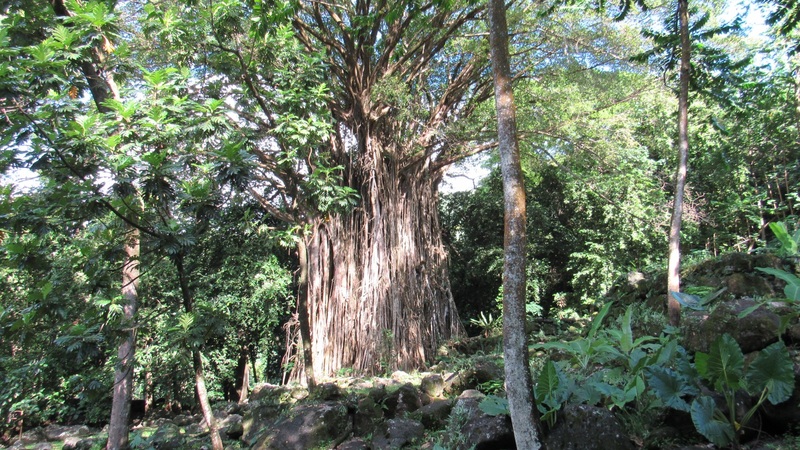 Ancient banyan trees mark the sites of tohua Kamuihei, tohua Kikokua – well preserved tikis and the Meae paepae, a giant platform made from hundreds of boulders – a gathering ground for rituals and where human sacrifices took place. At the base of the banyan tree a human skeleton was discovered. There is a very deep well, perhaps as deep as 10 feet, and that is today’s depth. The left Tiki in the following picture is depicting a murder of a baby, not sure if it was a sacrifice or the killing of another warring tribe member’s family. 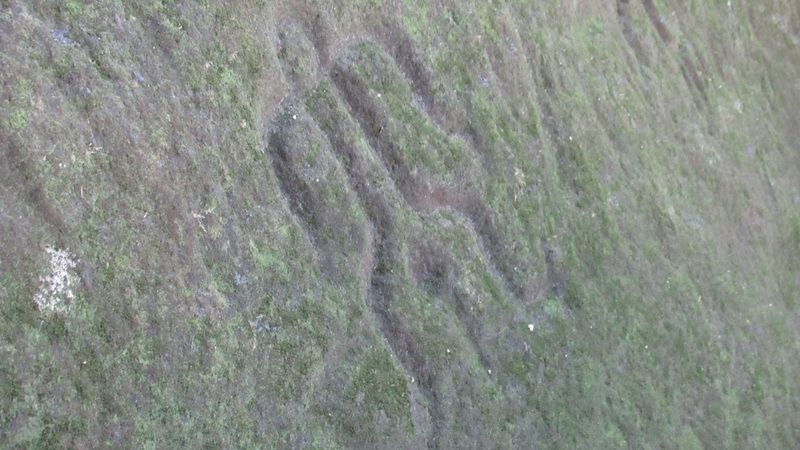 Though the petroglyphs have eroded away over the centuries, we were able to get a pretty good glimpse of the ancient culture. 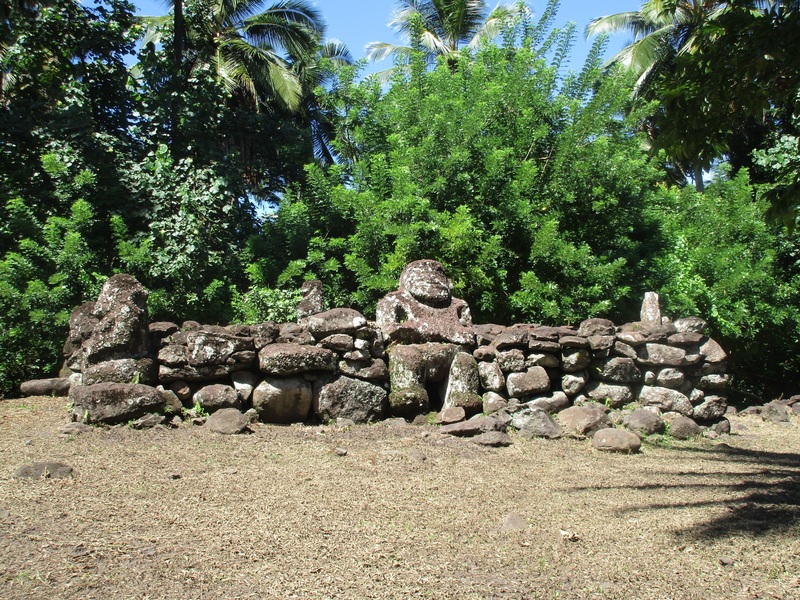 If you have a chance, research Hatiheu Bay and the famous archaeological sites. You’ll be wanting to see them up close and hike over the massive platforms. We couldn’t imagine how they built these platforms with such precision and symmetry using boulders. Just hauling the massive boulders was a feat. Running short of time and good weather to sail around the island we chose to drive to Controller Bay to visit Taipivai Bay. Many legends are set here. The famous novel “Typee” by Herman Melville resided here a couple of weeks at the end of the 19th century. 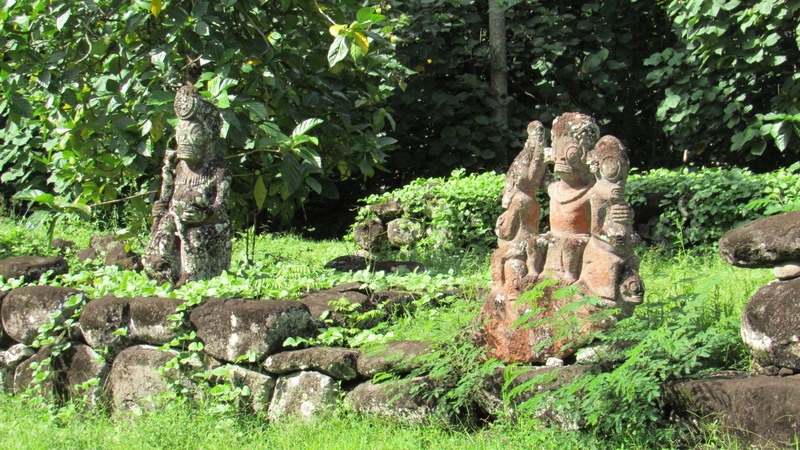 The paepae is impressive though the tikis aren’t as well preserved as Kamuihei. We were eaten alive by the no-nos and mosquitoes visiting the ancient ruins. Our buddy boat crew member came down with dengue fever 2 days after we arrived back in Taiohae Bay. The incubation period is 3 – 14 days so we think we’re safe. He may have contracted dengue at Daniel’s Bay, another bug infested anchorage. Despite liberal amounts of deet, various citronella oils and sprays, we can’t get away from them. We each made a decision to get a tattoo representing our “rite of passage” across the Pacific. The artist is famous throughout Polynesia and himself covered in beautiful designs. It’s a personal choice of art representing various influences in our lives. Some of it is so personal that I chose not to disclose their meanings. I have received a lot of compliments on the delicate design. John may share his design, he hasn’t decided yet. It hurt in some of the more sensitive areas but overall it was an okay experience. 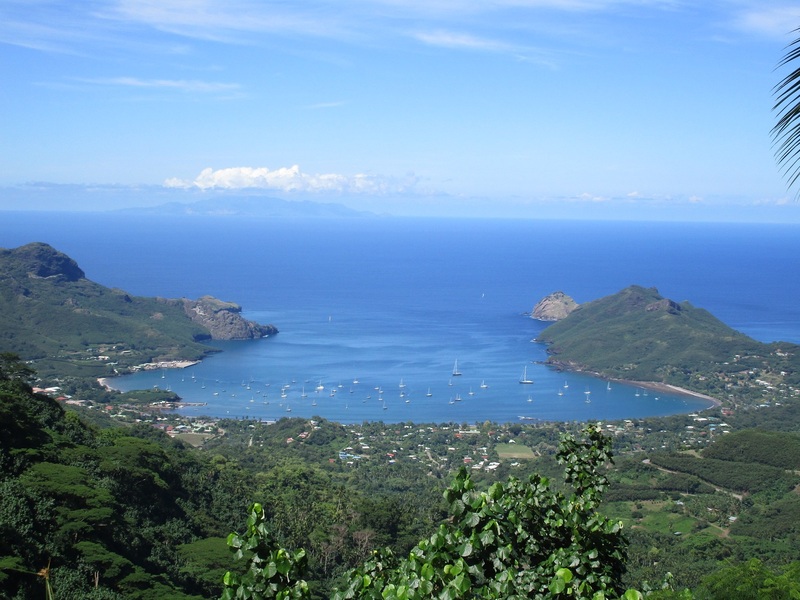 We dearly wish we could stay on in the Marquesas, there are 4 other islands that we are missing out on. Pictures posted here doesn’t do them justice! The proud Marquesan people, culture and history have been so fascinating. 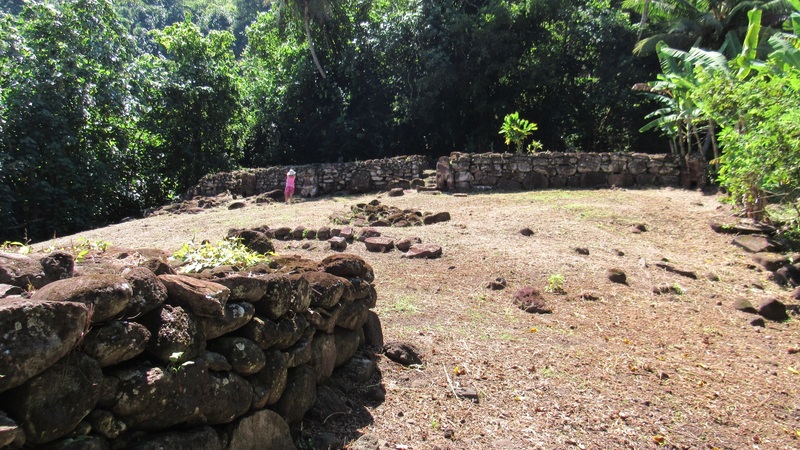 Nuku Hiva has more to offer but we’re preparing to leave for the Tuamotu soon. Our FP visa is good for a short 90 days, and so much to see in other areas. We’re watching the weather, provisioning, making google earth charts and talking with other cruisers heading in the same direction. 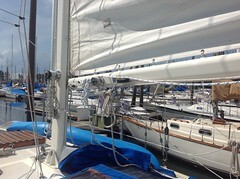 We have about a 4-5 day passage, hoping for fine sailing weather. The South Pacific convergence zone was over the Tuamotu islands last week and was a rough passage for some. 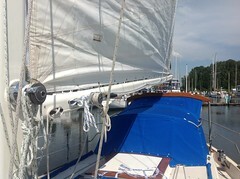 The Big Z has moved south now and the forecast is for lighter winds. We’ll post when we arrive and tell you all about it.